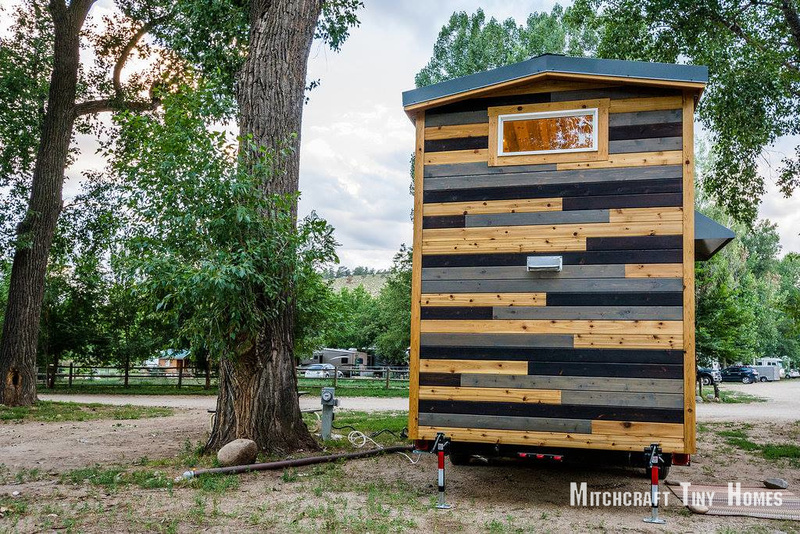 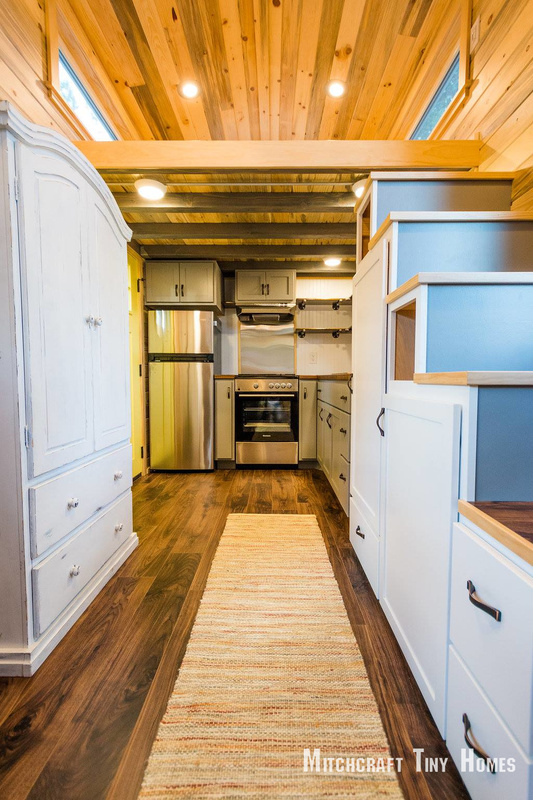 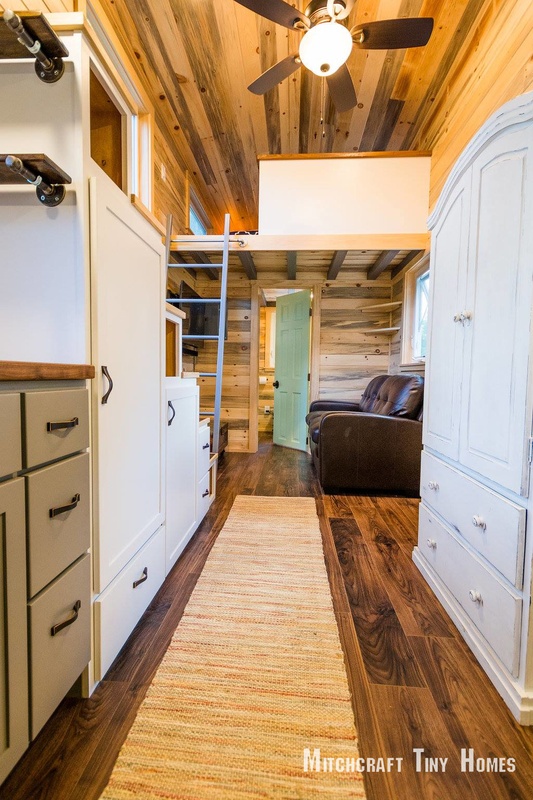 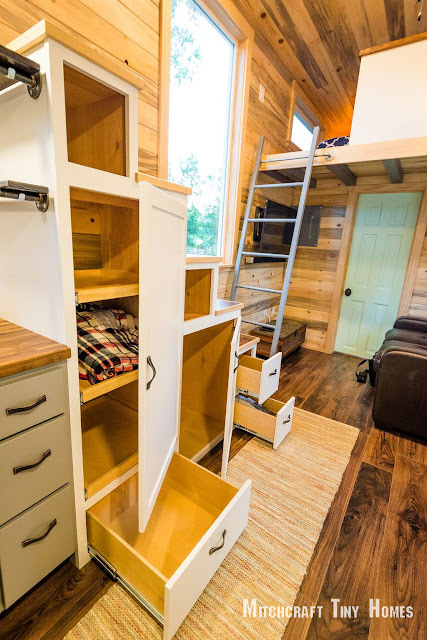 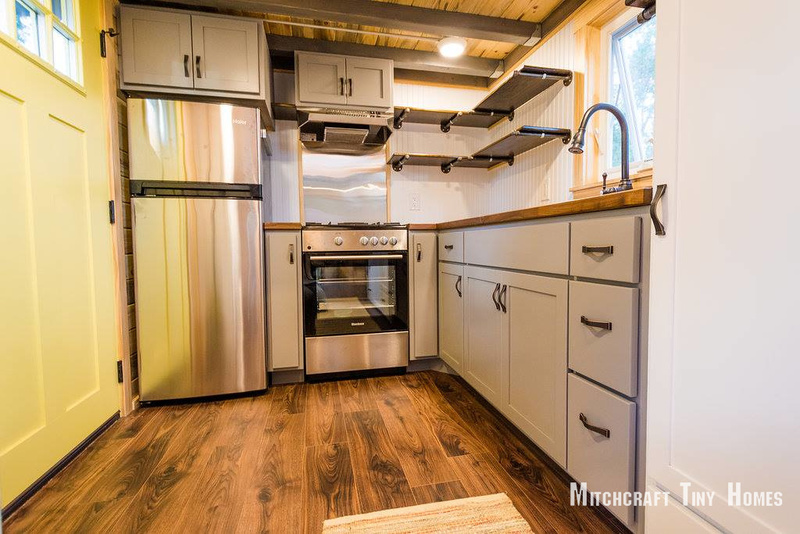 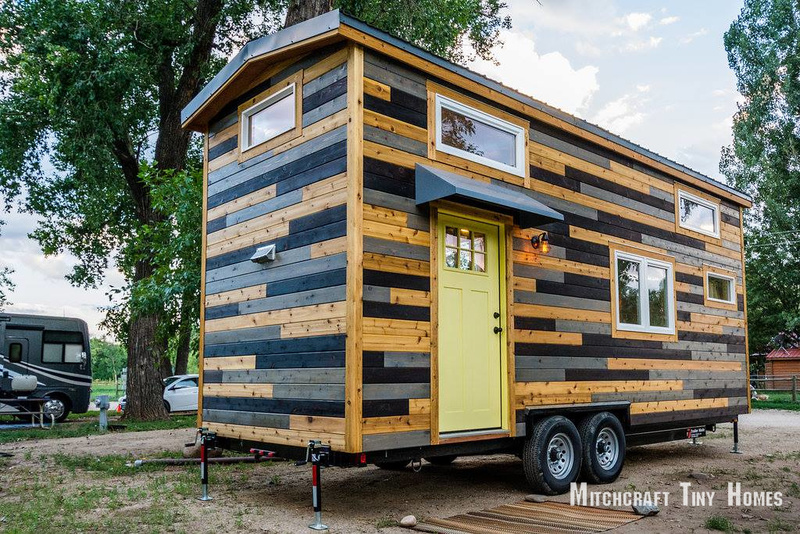 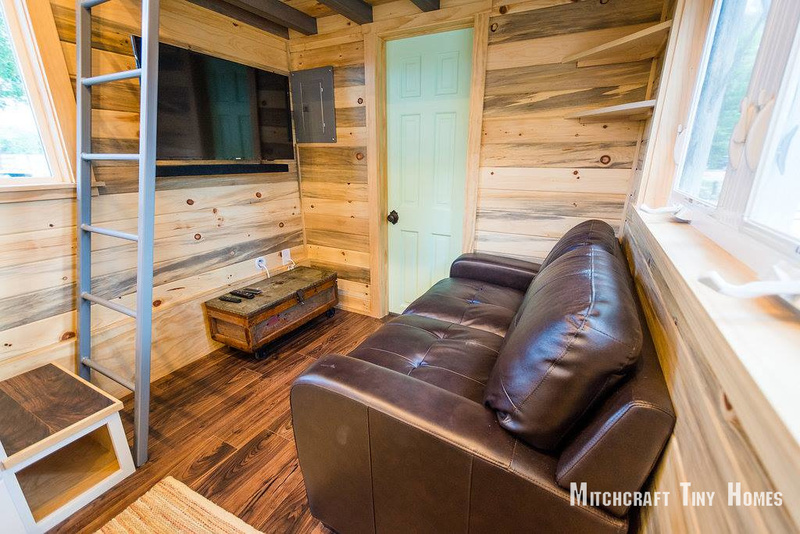 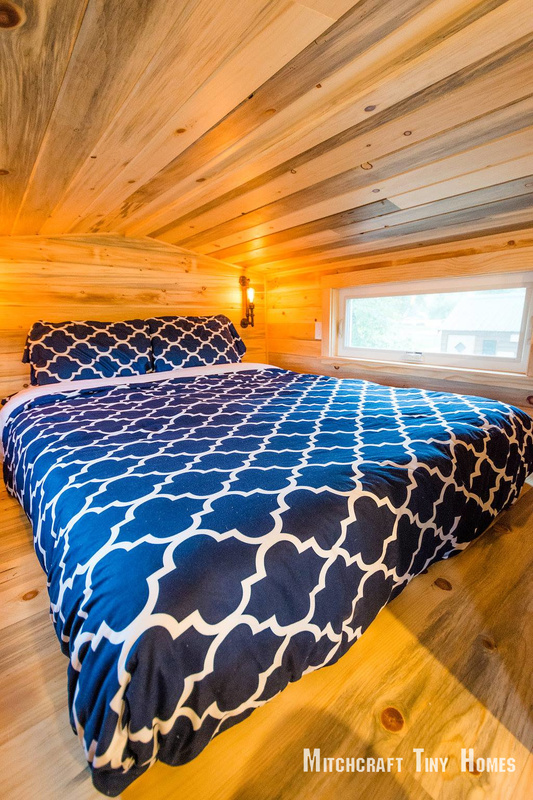 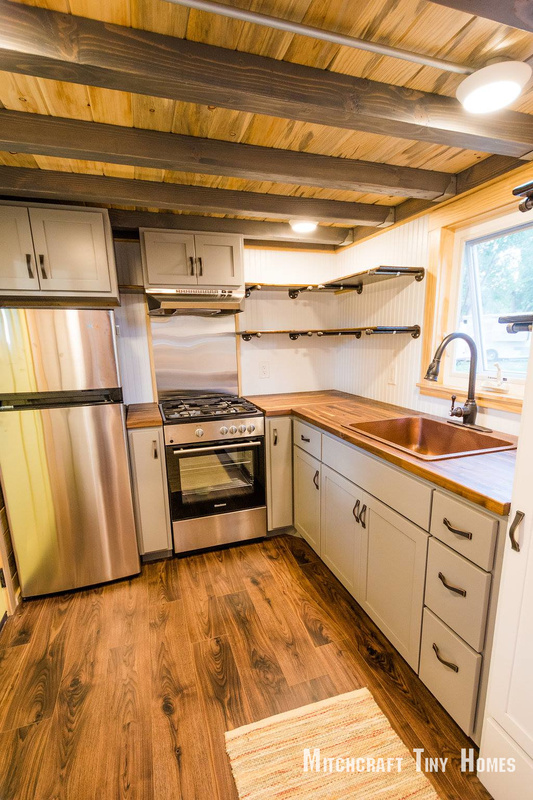 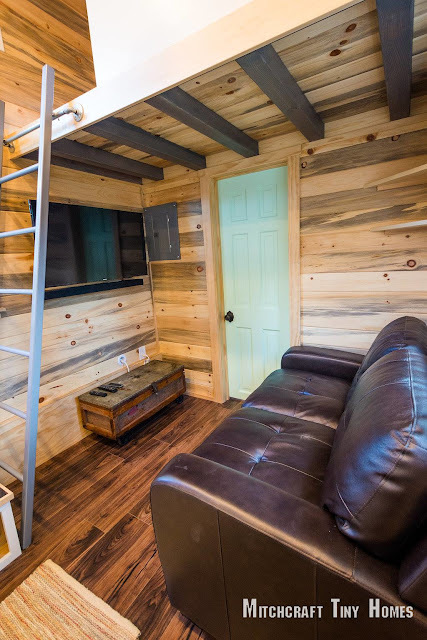 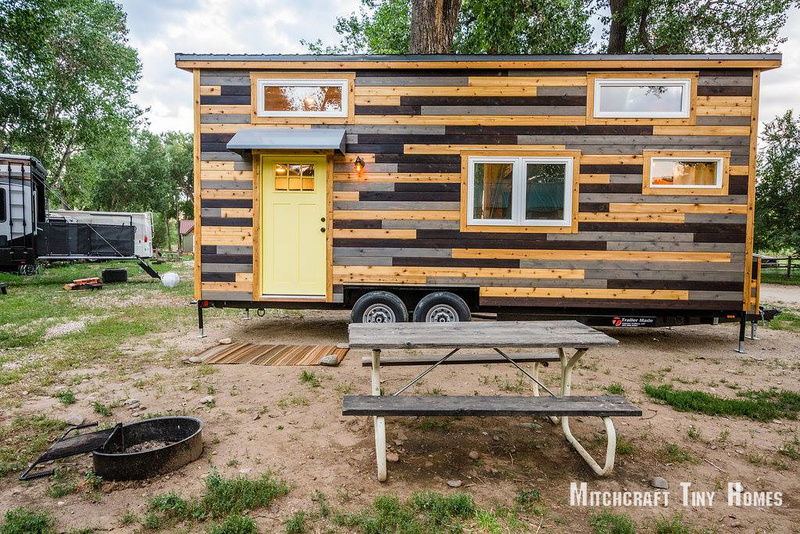 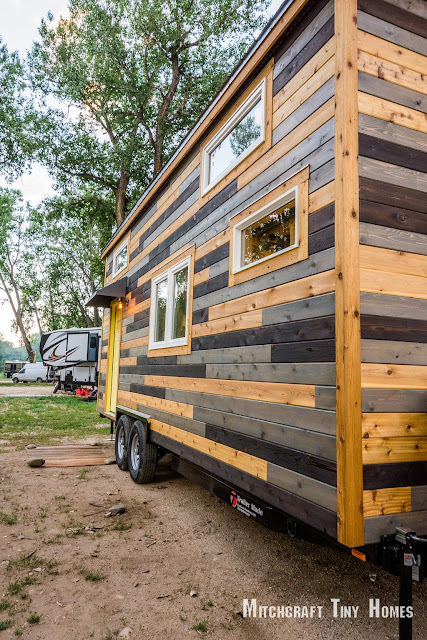 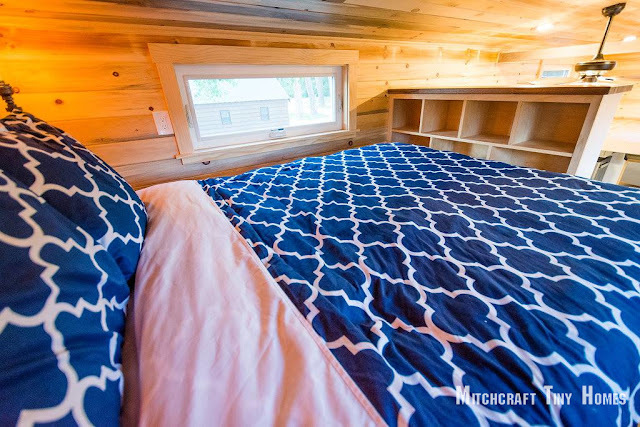 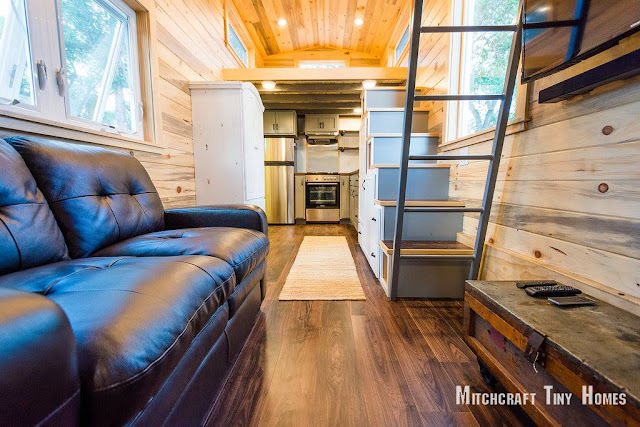 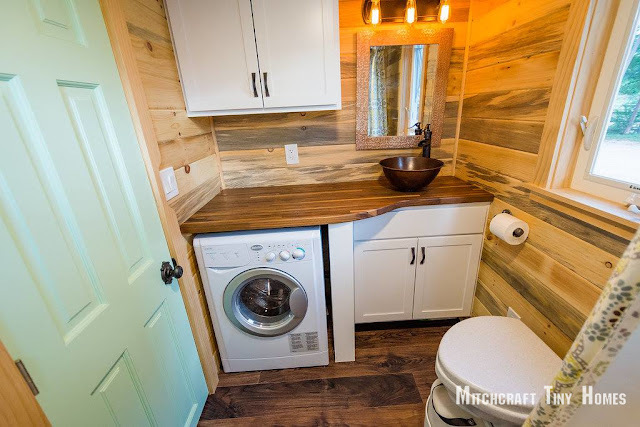 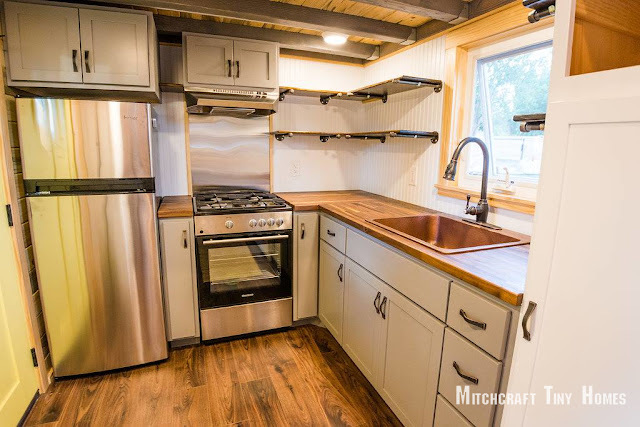 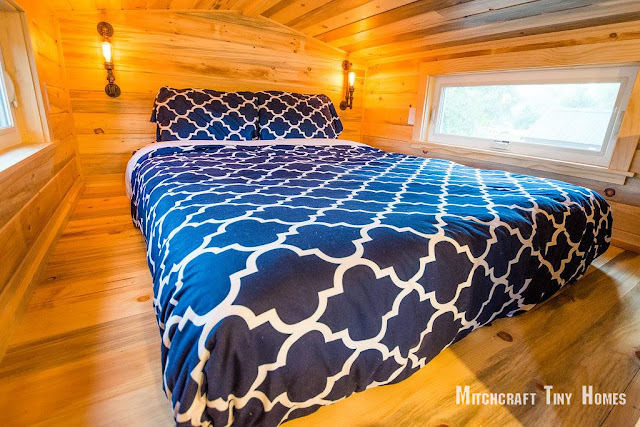 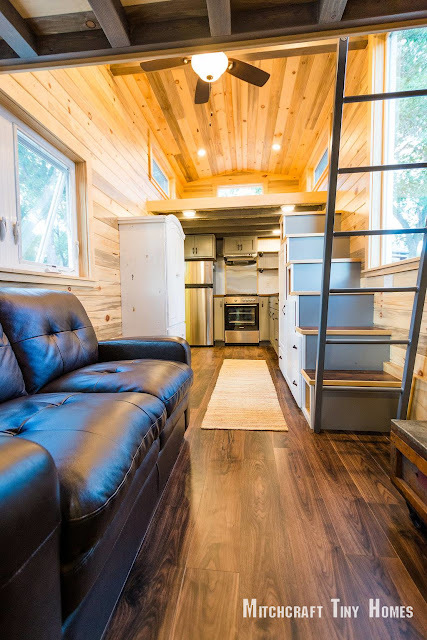 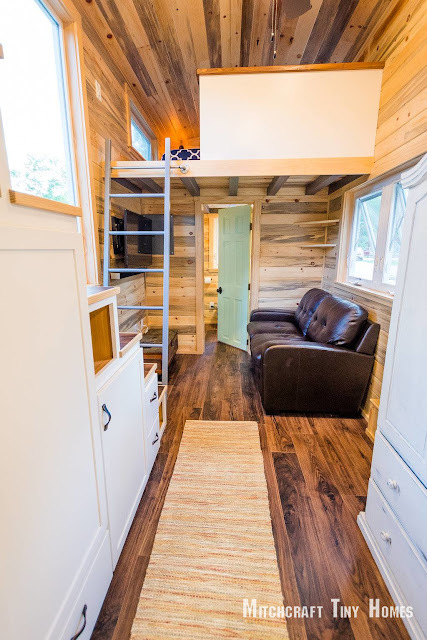 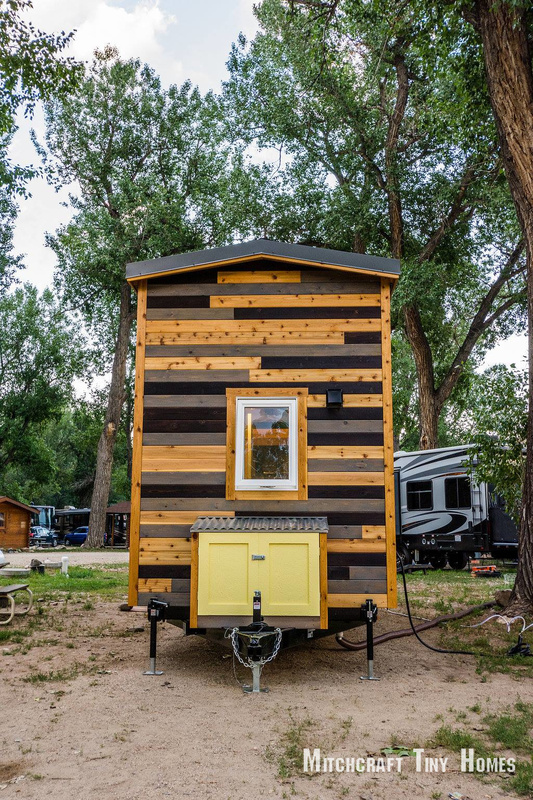 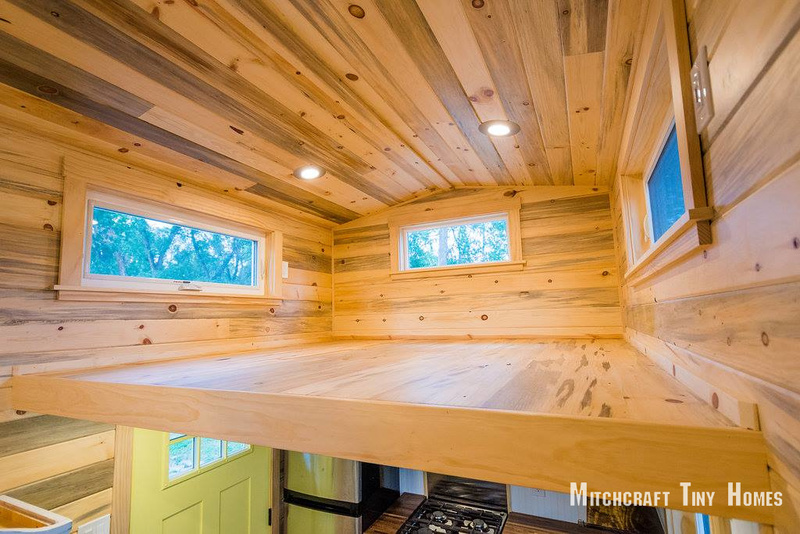 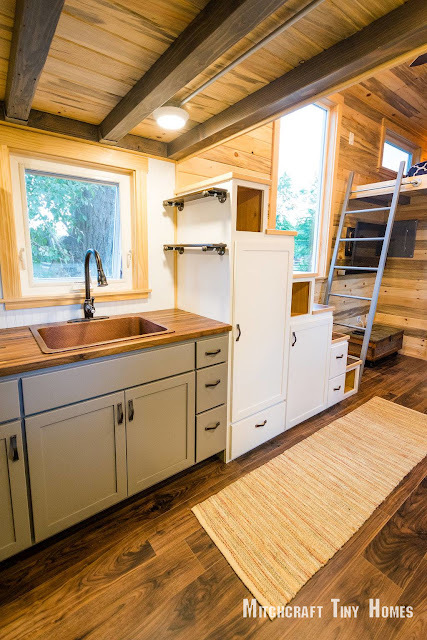 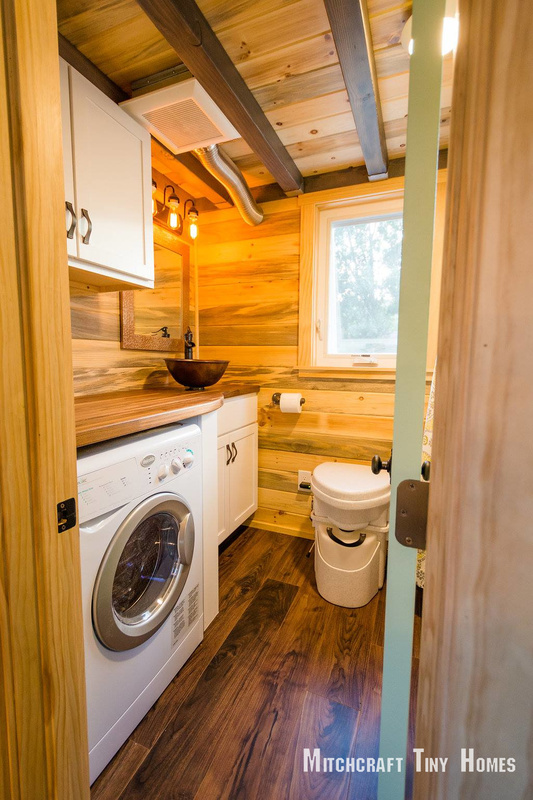 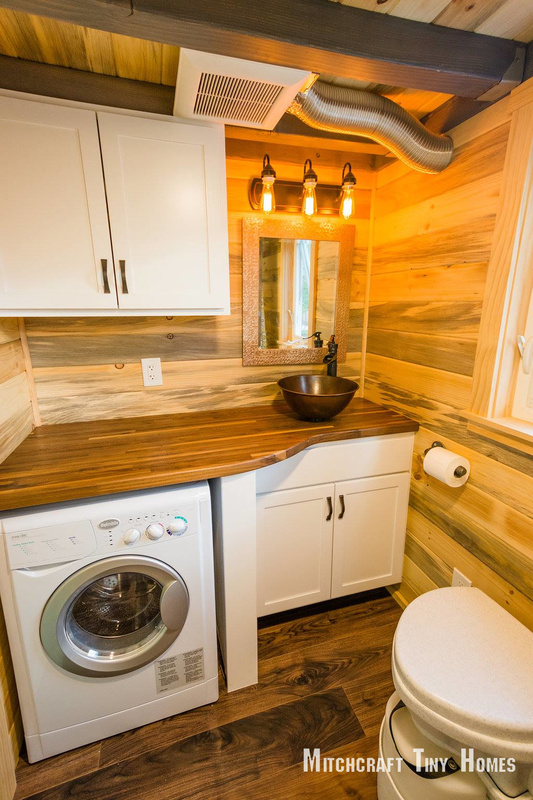 This unique 24' tiny house, from Mitchcraft Tiny Homes, is a beautiful custom build that brings functionality and style into a small space. According to the builders, this model home would take about 5-6 weeks to complete; and if you’re willing to wait, you could have your own dream tiny home like this one! When you walk into this home, you’ll see that you are in the kitchen. 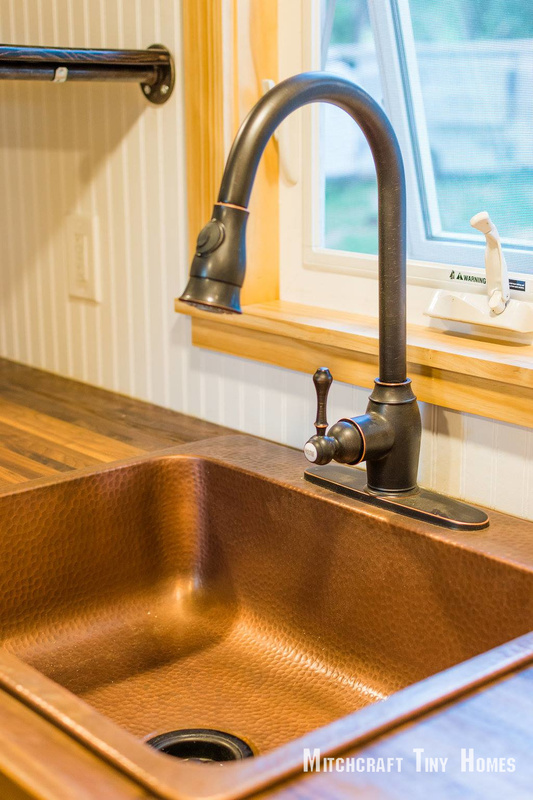 The kitchen features wood countertops, white cabinetry, a copper-tone sink and stainless steel appliances (i.e. 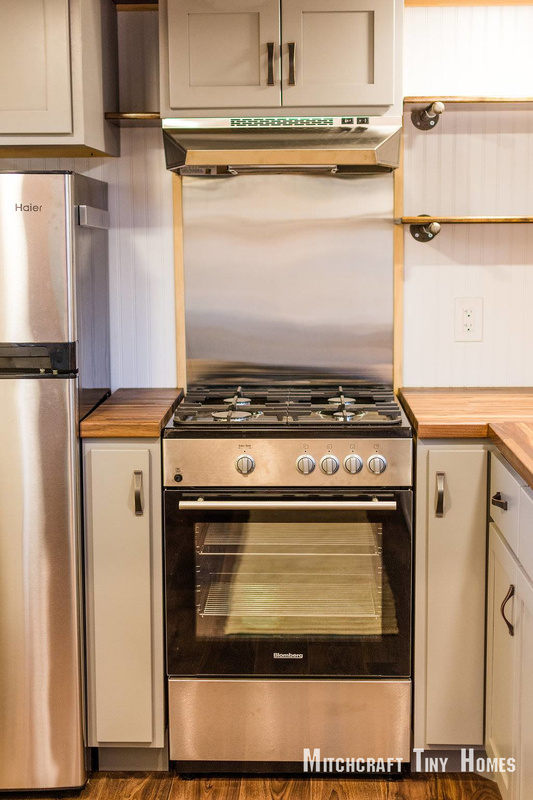 full sized refrigerator/freezer, 4-burner range and oven). 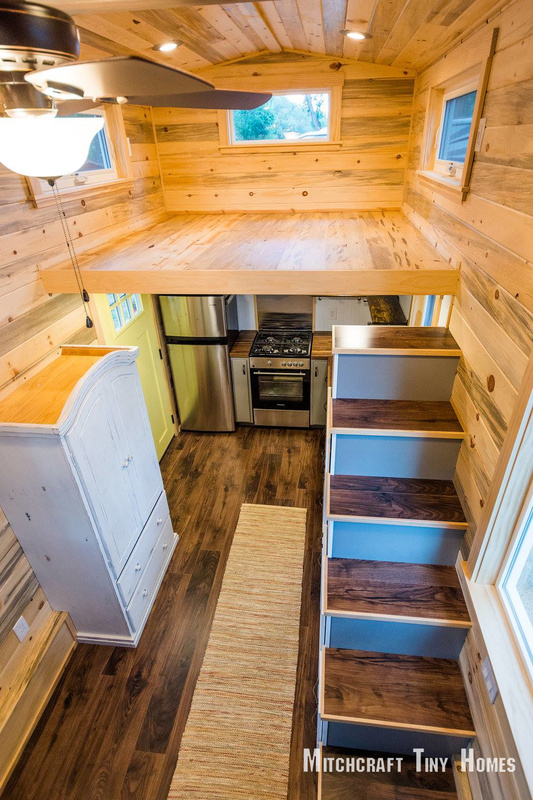 Bordering the kitchen is a staircase that leads up to one of the two sleeping lofts. 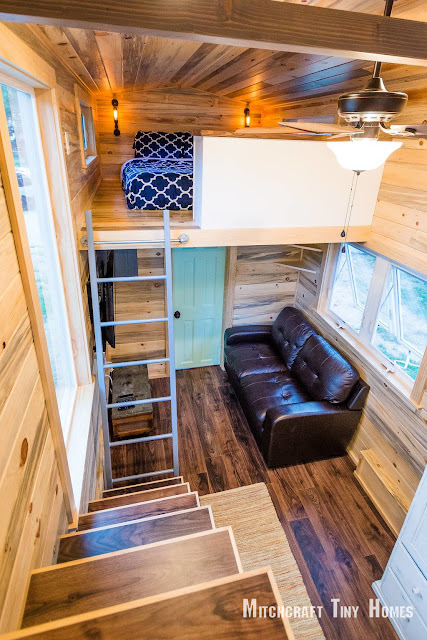 The other loft is located on the opposite side of the house (above the bathroom) and can be accessed via ladder. Continuing to the right of the home and past the staircase is the main living room. This space is furnished with a brown, leather sofa and wall-mounted flat screen TV. 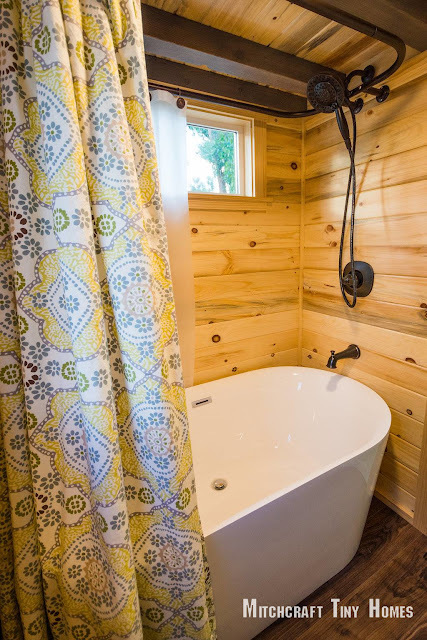 To the right of the living room is the large bathroom that features a washer/dryer unit, toilet, bowl-shaped sink, white cabinetry (like that seen in the kitchen) and a large soaking tub w/ shower. 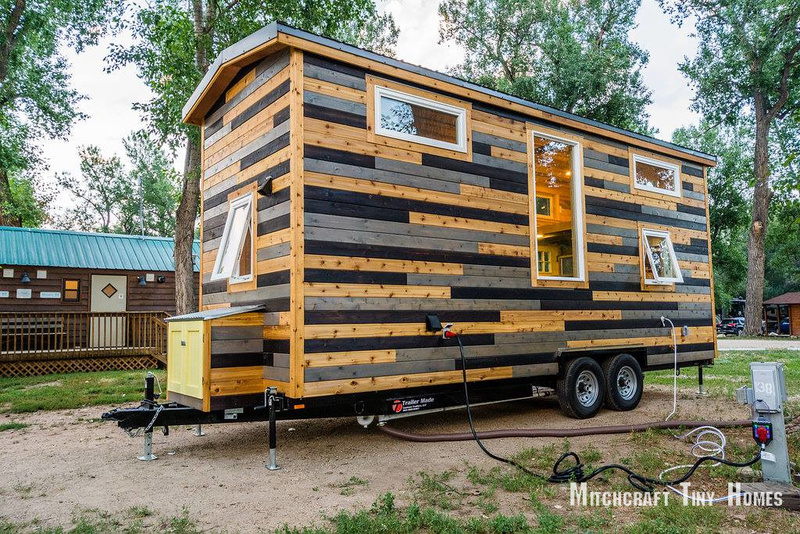 To build a similar model, expect to spend $67,000. 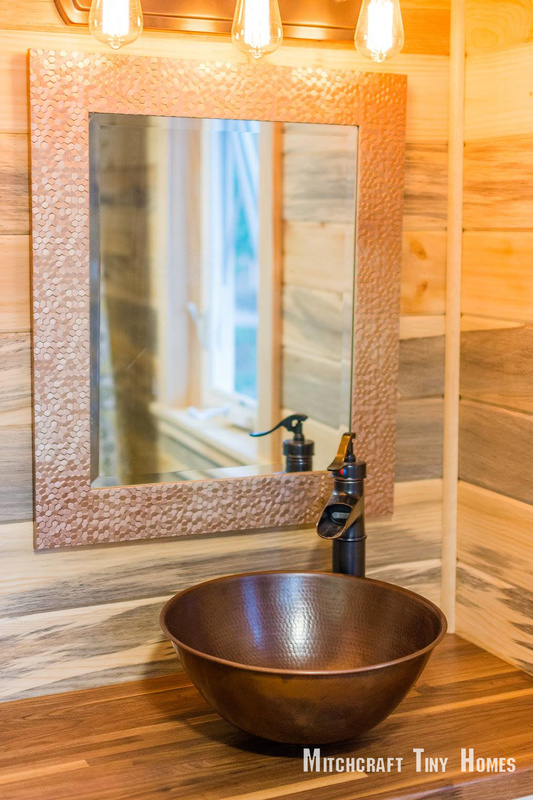 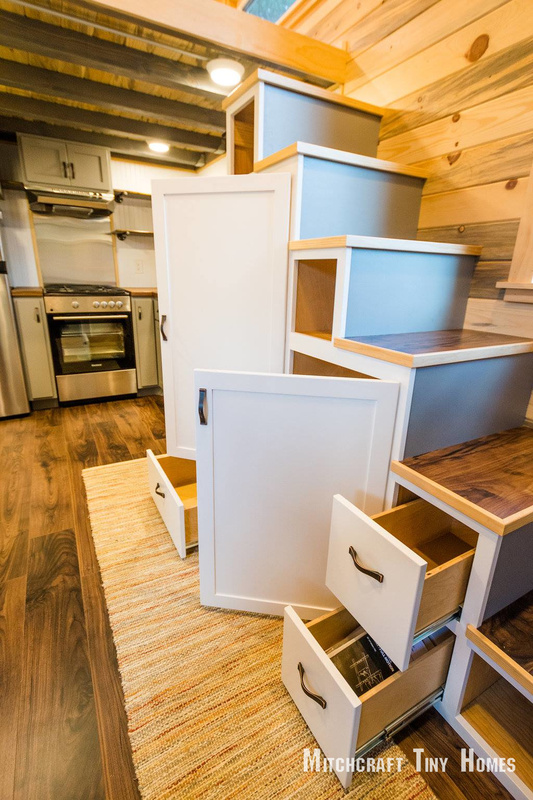 For more info, contact Mitchraft Tiny Homes here! If you like the home, one of the home's owner now runs her own YouTube channel about tiny living here! 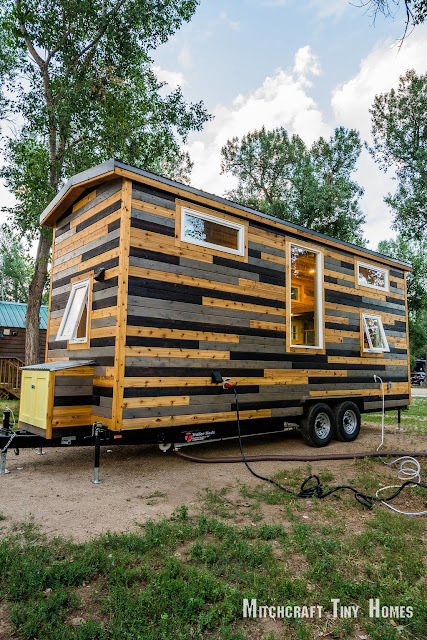 You can also check out a video tour of the home below.